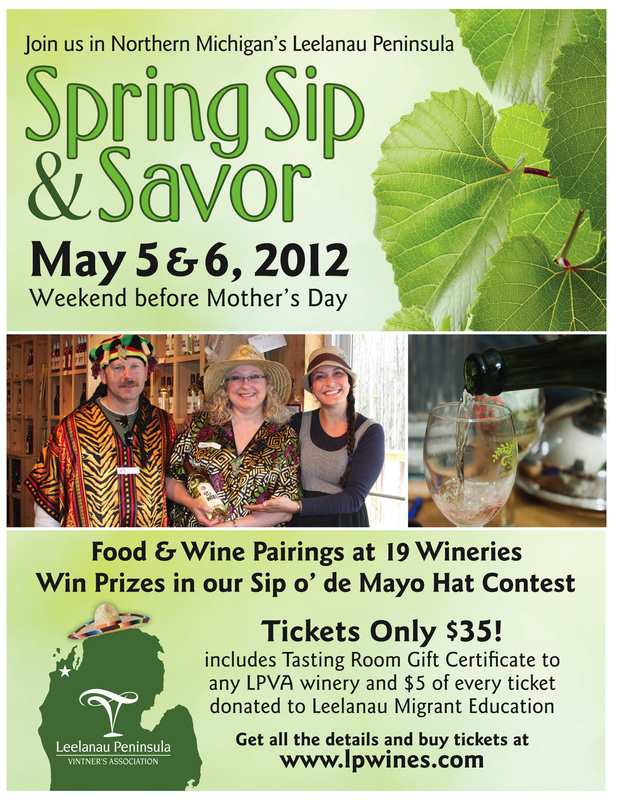 The Spring Sip & Savor returns to the Leelanau Peninsula wine trail the weekend of May 5 & 6, 2012. This annual celebration features food & wine pairings at 19 wineries along with the "Sip O de Mayo" hat contest - a chance to show off your best hat and win prizes including a fantastic getaway to Michigan’s Wine Coast! A portion of proceeds to benefit migrant worker education in Leelanau County. Great Hats and Great Wine! Wear your best hat and win prizes in the "Sip O de Mayo" hat contest! After a long winter, the wineries of the Leelanau Peninsula Vintner's Association shake off the snow and celebrate the return of spring with the Sip & Savor wine tour. The event features wine & food pairings at each of the wineries on the Leelanau Peninsula Wine Trail along with a tasting room certificate to help you purchase that special bottle. Wine tasting can sometimes feel a little intimidating, so the Sip & Savor has always featured an element of fun. The event takes place on the weekend of Cinco de Mayo, and the wineries have decided to hold a “Sip-o de Mayo Hat Contest” in which every winery will offer an award for their chosen category of hat, allowing you to kick loose and have a chance to win all kinds of prizes from wineries and local businesses. The ultimate is a fabulous Grand Prize awarded by popular vote of participants. The winner will receive two nights lodging at The Homestead in the heart of the Sleeping Bear Dunes during any season of the year, dinner for two with appetizers and dessert at nearby La Becasse, Sunday Brunch for two at the Bluebird in Leland, a wood-fired pizza from the Hearth & Vine Cafe at Black Star Farms and a pair of tickets to any LPVA Weekend tour or the Traverse City Wine & Art Festival! Spring is also about new growth and planting in the vineyards, and in 2012, the Leelanau wineries have decided to encourage some new growth in our community by allocating $5 from every Sip & Savor ticket to migrant worker education in Leelanau County. Tickets for the Spring Sip & Savor are $35. Packages with area lodging partners are also available, all on our website at http://www.lpwines.com - tickets are limited! Our wine trail events do sell out so please purchase in advance. Bel Lago will be serving their 2010 Bel Lago Pinot Grigio with a Spring Minestrone Soup, a hearty chicken stock base with chick peas, orzo and fresh asparagus, spring peas, spinach, kale, new potatoes, diced tomatoes, artichoke hearts and a few ramps finished with pesto and garnished with grated Parmesan. Their hat contest will be for “Best Use of Cork” with a prize of a Higher Grounds Fair Trade Coffee Gift Basket. Black Star Farms will offer a Taco bar and will be pairing the tacos with their Hard Apple Cider. They are looking for the “Fanciest Hat” and the prize will be a $25 gift certificate good at the Hearth and Vine Café, Arcturos Dining Room, or Tastes of Black Star Farms. Chateau de Leelanau will be serving Pulled Pork Tacos paired with their Solem Farm Red. Their hat contest is the “Biggest Hat” with the prize of a Chateau de Leelanau T-shirt and a pair of socks from WineSippinSocks.com. Cherry Republic will prepare Chicken and Bean Enchiladas matched with their own cherry Sangria with fruit and their House ginger ale. The hat contest for the most “Authentic Mexican” hat will award a prize of a bottle of their Sangria and a few different varieties of their Salsas and Chips. Ciccone will be serving a Taco Salad paired with a Sangria featuring their house Dolcetto. They are looking for a “Fabulous Floral” hat and will award a Ciccone wine basket with a Tuscan Bistro gift certificate. Forty-Five North presents Pound Cake topped with Strawberry Honey Butter, paired with their newly released 2011 Rose of Cabernet Franc or Sparkling Strawberry Wine. Their contest seeks the “Most Divine Hat” for which they will award a $25 gift card to Forty-Five North. Gills Pier will be serving Gazpacho Shooters paired with their 'Just Unleashed' Red. 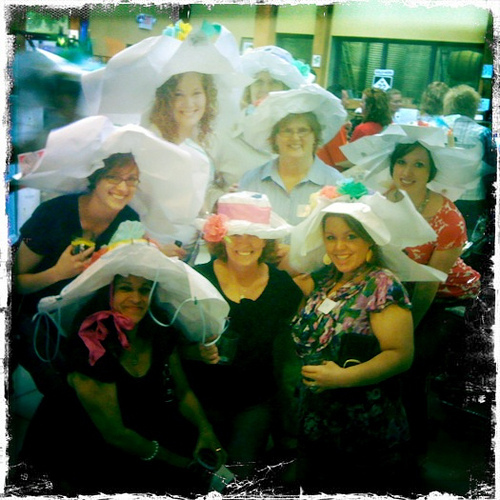 They are celebrating the 2012 Kentucky Derby and awarding a prize of a $50 gift certificate from Diversions hat store for the best "Derby Fashionista." Good Harbor will showcase their Trillium with a Mexican Corn Chowder. Their hat contest will be “Best Sombrero” with a 2012 Leland Wine & Food Festival poster for the winner! Good Neighbor Organic will pair a cold Spring Chicken & Spinach Pasta Salad with their semi-sweet cider and their organic white wine. They are looking for the “Most Organic Hat” with the prize of bottle of Apple Ice Wine. L. Mawby will be serving local Xylo Bistro’s Ceviche in scoop corn chips (there will be a non-shellfish alternative available) and pairing it with their ‘Wet’ Sparkling Wine. They are looking for the best hat for wearing in “Wet” weather. Prize TBA! Leelanau Cellars will feature their Baco Noir Rose paired with Quesadillas, with contest and prize coming soon! Longview Winery presents their Pinot Gris with a Roasted Salmon Chowder. Their hat contest will be “Most Eye-Catching” with a prize of a Connoisseur corkscrew for the winner. Silver Leaf is pairing their Purple Passion served as a Sangria with a classic Spanish tapas, Patatas Brava, spicy and hot potatoes with a Brava sauce to match, along with another classic, Chorizo Brazed in Red Wine. Their prize will be given for “La chica en un sombrero más guapo” (the woman in the most beautiful hat). Verterra offers Spicy Pork Enchiladas with red and green sweet bell peppers paired with their Pinot Gris/Grigio. 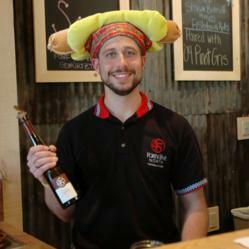 The “Most Colorful Hat” as judged by the tasting room staff will win two bottles of Verterra wine. Willow will be serving Mexican Strawberry Crunch With Strawberry Fondue, paired with their Baci Rose. They are awarding a Willow Gift certificate with T- Shirt for the best “Animal Print Hat”! Join our Facebook pages and connect with other Leelanau wine lovers! LPVA was formed in 2000 with a goal to help spread the word about all the wonderful things our wine trail and the Leelanau Peninsula has to offer. Today, it is the largest and strongest of the four organized wine trails in Michigan which promote the state's nearly $790 million grape/wine industry.